That same year, 1983, Kalle Grundel took the Group A Golf GTI rally car to victory in the German Rally Championship and, behind the scenes, VW Motorsport were starting work on its replacement as the new Golf was phased in. Up to that point, Group 1 and Group lb GTIs had 148 or 150bhp for the track and the rally cars, in Group A, anything from 170bhp to 200bhp depending on spec. The Bimotor Scirocco was originally devised as a Group B rally weapon, but it w as not until 1985 that the green light was given to incorporate the lessons learnt from this car into an official rally machine. 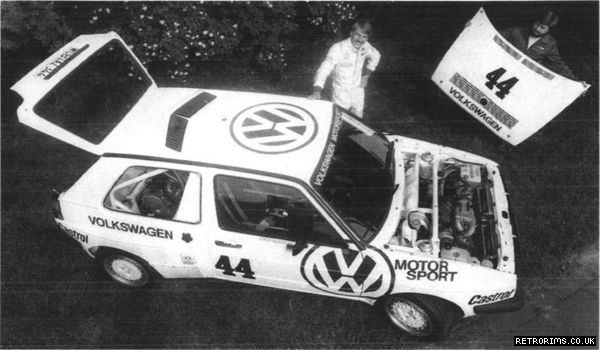 The Twin Golf was not going to enter the fray of international rallying though; its objective was an attempt at the Pikes Peak hill climb record with successful GTI driver Jochi Kleint at the wheel. The gravel-surfaced Pikes Peak hill climb in the Rocky Mountains in Colorado provides a supreme test of competition vehicles, their design unhampered by any homologation requirements. The first twin-engined Golf driven at Pikes Peak by 1979 European Rally Champion Jochi Kleint had two 195bhp 1.8-litre power units. The second version, below, had turbocharging to overcome power loss at high altitude: despite a reduction in engine capacities to 1.3 litres each to keep the car in the same class, the total power output was up to 500bhp. Pikes Peak in the Rocky Mountains in Colorado is over 13,000ft high. The view from the startline, over 8,500ft up, is breathtaking and of course the altitude extracts a heavy toll on naturally aspirated engines. The winding, loose surface road up the mountain is 9.4 miles long and has 156 turns. 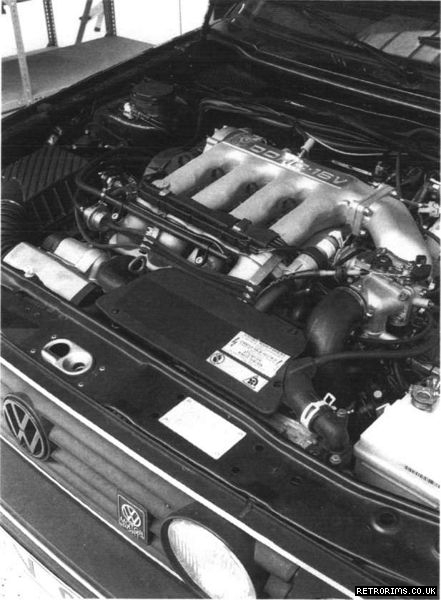 VW’s challenge to nature had a pair of l,807cc Oettinger engines of 195bhp apiece to power it and, running an 11.0:1 compression ratio, they supplemented the combined 390bhp at 7,500rpm with 3381b/ft of torque at 5,800rpm. Performance was not dissimilar to the Bimotor Sciroccos with a 0-60mph time of 4.3 seconds and a top speed of 162mph depending on final drive. It was quickly established that the altitude was doing the car’s engines no favours and for a really serious assault on the Peak in 1986, a change of tactics was called for. To keep the car in its engine capacity class, and use turbocharging, VW had to resort to the use of much smaller engines. Their choice was the 1,300cc Polo engine, and these small power units were modified to take a KKK turbocharger each, with intercooling. Bosch K-Jetronic fuel injection was grafted onto the engines and boost pressure was variable between 1.4 and 2.0 bar. At peak boost, these 8.5:1 compression engines kicked out 250bhp each giving a sum total of 500bhp at 7,000rpm and 3841b/ft of torque at 6,000rpm. Weighing just 2,3101b, 1001b less than a Corrado and about 2501b heavier than a Golf GTI, the 1986 Twin Golf was good for a 3.4 second burst to 60mph and a top speed of 193mph! That car was still essentially a Golf beneath the sheetmetal work, though, and for the 1987 attempt on the Peak, VW fielded what amounted to a silhouette racer. The centre section of the car was a monocoque cell constructed largely from aluminium in the best racing-car tradition. From this were hung the front and rear tubular space frames to which the engines and suspension components were attached. Although, to onlookers, the front and rear detachable engine covers were perfect replicas of a production Golfs, even with standard looking wheelarches, these were just glassfibre components held in place by quick release fixtures. The car weighed just 2,2441b and had 652bhp to propel it. That is a power-to-weight ratio of 3.431b bhp! Unlike all the previous cars, this one had the engines mounted in-line. Those engines were a pair of 1.8-litre 16-valve Golf engines prepared by Kaimann Racing to full competition spec. 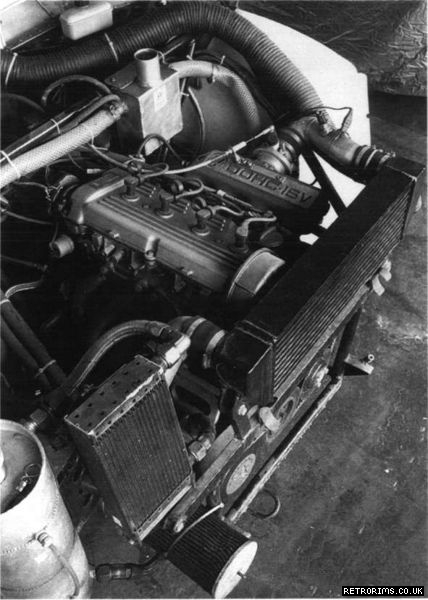 An intercooled KKK turbocharger boosted each one to 1.3 bar at full throttle and, with the 8.5:1 compression ratio, output was 652bhp at 6,800rpm and 4281b/ft at 6,400rpm. Two huge fans extracted air through the rearmounted radiators giving the rear of the car the appearance of a James Bond movie car that looked equally capable of aquatic duties. 0-60mph took 4.1 seconds and the car was geared for just 114mph through Formula 2 Hewland gearboxes and running on 225/50VR16 tyres. The last of the three Golfs for Pikes Peak was really a silhouette racer, with a pair of these 326bhp turbo engines specially prepared by Kaimann and longitudinally mounted. The three Pikes Peak Golfs never won their events but they finished in the top ten in the three years they competed. They provided valuable experience with regard to the synchronization of two engines in one chassis and what could be achieved with four-wheel drive. These full-house competition Twin Golfs were also the ultimate expression of an idea that was born over a few drinks in a bar seven years earlier. In automobile production, economies of scale are all-important. The main Volkswagen plant is geared to produce cars like the Golf in runs extending ultimately to eight-figure numbers. Inside the VW Motorsport workshops in Hannover, with three Rallye Golfs in various states of preparation. The few hundred thousand Scirocco, Golf Cabriolet and Corrado models are farmed out to the coachbuilders Karmann. 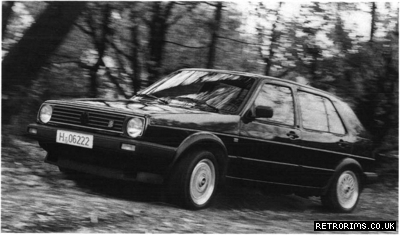 Even smaller runs like the 5,000 Rallye Golfs produced for motorsport homologation are made in the Brussels plant. One-offs or very small runs of really special cars are the speciality of VW Motorsport. For VW Motorsport is more than just the factory’s competition department. Like BMW, VW sees its Motorsport division as playing a rather wider role. In their new premises in Hannover, VW Motorsport personnel are competition, development, limited edition production and customer special wishes rolled into one. They even have a restoration department which can turn rusting hulks into pristine exhibits for the VW AutoMuseum in Wolfsburg – or for customers. The Golf G60 Limited is a real wolf in sheep's clothing, its external appearance giving little clue to the 21 Obhp supercharged engine and fourwheel-drive running gear lurking beneath. One function of VW Motorsport is to undertake short production runs of special cars like this. 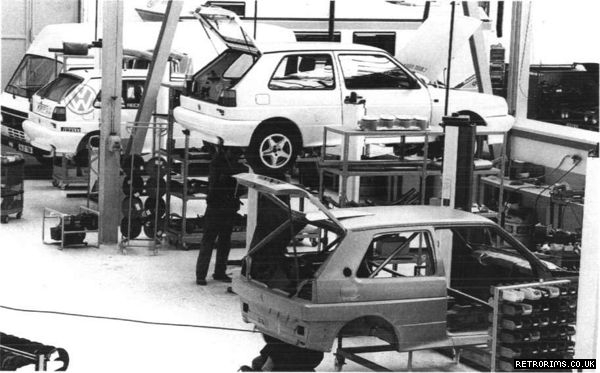 In the squeaky-clean main workshops, a visitor would see the mechanics working on existing Rallye Golfs, or knocking new bodyshells into shape for their competition debut, while other specialists may even be building the 130bhp VW LT Van support vehicles that follow the rally cars to events. Turn the corner and you are confronted w ith the area w here the ‘specials’ are built. A oneoff heavily modified G60 Passat was being built for VW Motorsport head, Klaus-Peter Rosorius, during my visit, and in a bay next to it, a customer’s standard looking Polo hatchback was in for servicing and tuning. It had a supercharged G40 engine under the bonnet; GTI performance in a shopping car! Directly opposite this a fivedoor Golf syncro with slightly flared arches and big w heels lay at rest. A turbocharged 200bhp 16valve engine had been installed in this car. The rest of the facility was given over to production of just 70 Limited Edition Golfs. Engine of the Limited combines the 16-valve head and Glader forced induction. VW Motorsport grille badge denotes the car's origin. Built largely by hand, these cars were based on a fivedoor syncro with its viscous-coupled four-wheeldrive system. To this was added ABS, power steering, electric windows, central locking, steel sunroof, heated front seats, a full leather interior and an on-board computer. Tuners in Germany have already begun to exploit the latent potential of the G60 engine, offering conversions ranging from 180bhp to 200bhp for the Corrado and Rallye Golf. VW Motorsport go one better right from the start by applying the G60 supercharger to the 16-valve rather than the eight-valve engine. The result is 21 Obhp (DIN) at 6,500rpm and 1861b/ft of torque at 5,000rpm with an 8.8:1 compression ratio and the supercharger providing 23psi of boost. More than that, this power is developed from an engine 86 with full compliance to US emission regulations via a pair of three-w ay catalytic convenors, a clean engine that runs on super unleaded fuel! Digifant electronic injection is important in achieving such controlled efficiency. The Limited mav look like a standard five-door Golf with 6V2J x 15in BBS alloy w heels and 195 50YR15 Pirellis, but this wolf in sheep’s clothing has the drivetrain from the Rallye Golf including its complete front-end beneath the standard front wings. This means that the inner arches are larger to take wide tyres without fouling the suspension and the new gearbox and large capacity radiator are also grafted in. ‘Thus, various bits of the car are sent from Brussels and Wolfsburg to come together in I lannover. 21 Obhp in a car the size of a Golf is a lot, but the Limited is not a strippedout racer; it is a compact, all-weather luxury express. It tips the scales at 2,8051b at the kerb which makes it some 7001b heavier than a GTI 16Y. ‘That weight eats into the performance, but even so 7.2-second 0-60mph time and a 142mph top speed is not to be scoffed at. ‘The Golf G60 I limited is the fastest production road car to have left any VW plant destined for a private customer. 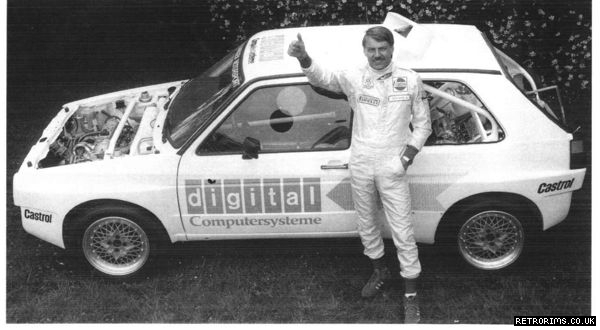 Like most of the projects that emanate from VW Motorsport, it was the brainchild of Klaus-Peter Rosorius. it took a long time to realise this project,’ he explained, ‘but we were fortunate to have the help of many engineers in the design and development department at Wolfsburg. ‘The idea w as to have a nice, elegantlooking production Golf without external modifications but lots of fascination under the bonnet.’ That aim has been achieved by the 70 Limited cars which are restrained in outward appearance even to the point of having simple, single headlamps. One customer who owns No 031 has fitted a four-lamp grille and wider 7J Borbet alloy wheels but all the other Limited cars have left the factor} in their metallic anthracite paintwork with just the blue grille surround and subtle VW Motorsport badges to distinguish them as instant classics. As for the future, Limited Editions of the Corrado and Passat have not been ruled out and when the VW V6 engine is released, who know s what w e might see from VW Motorsport. If the Golf G60 feels as though its chassis could handle more power, the Limited provides that power in the form of 210bhp from a supercharged 16V engine. Wisely, VW elected to pair it with their syncro 4WD system. While the standard G60 unit merely enhances the tractability of the eight-valve engine, the 16-valve version releases the full potential of the supercharger system. Acceleration is vivid, with 60mph coming up in 7.0 seconds. But what is impressive is that the power never seems to tail off until you hit the rev limiter just past 7,000rpm. Get to 100mph…smooth onward urge. 186lb/ft of torque at 5,000rpm is 3-litre pulling power and, with the drive going to all four wheels, once the fronts begin to slip under the strain of the torque, the handling balance of this car is beyond the capabilities of a normal front-wheel-drive GTI. Power-on in a tight corner and the Limited adopts a more neutral stance and full throttle can be applied early once the car is settled. In wet corners, power sliding out on opposite lock is possible, another fun element denied to the FWD Golf enthusiast. For all that, the Limited is a refined and mature vehicle that cossets its 120mph…and it is still pulling hard. Very low down, the engine still does not have the razor-edge response of a good naturally aspirated unit. Frustratingly – because it is so good past 2,500rpm – it does take a fraction of a second to ‘come to the boil’ and really get going. This is probably a function ofthe lower compression ratio (compared to a stock 16V) and/or insufficient gas speed at low rpm, a problem with many multi-valve engines. The G60 Limited Golf will only ever be experienced by a small group of GTI enthu-siasts, but this discreet special with 210bhp and 4WD is the hottest hatchback made by any major manu-facturer. Once it starts to build up, though, it is intoxicat-ing and you find yourself using the gears for the sheer exhilaration of feeling the strong and occupants in its leather upholstery and pampers them with luxuries like electric windows, central locking and a sunroof. 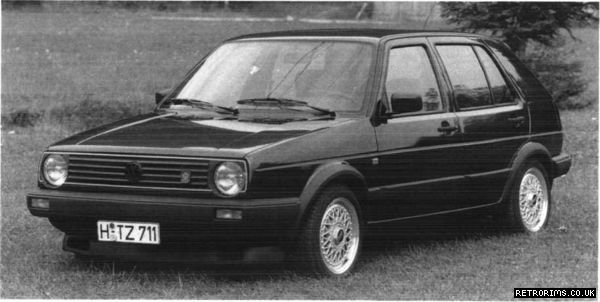 Only 70 Motorsport Golf Limited cars were made, lovingly constructed by VW Motorsport personnel during 1990, but this wolf in sheep’s clothing, looking just like any metallic black five-door Golf with a set of BBS wheels, is the ultimate hot-hatchback of its day just as surely as the original Golf GTI was. Advances in technology and in market conditions have created in this car a level of sophistication as telling today as that of the first GTI in 1975. Ironically, this Q-car shares one flaw with that original GTI: in its attempt to remain discreet in appearance, with just two headlamps, its night-driving capabilities are severely hampered.